I have been trying to create a beautiful loaf of gluten-free whole grain artisan bread for weeks now. Finally after many tries, and with some help from Artisan Bread in Five Minutes a Day I accomplished it. Check out their website for good step by step pictures. They use eggs in their recipe and I replaced them with flax eggs. I baked the loaves in my "La Cloche" at 500 degrees for 30 minutes, but you can also bake it in a dutch oven like the website shows. Make sure you follow the instructions perfectly because gluten-free bread is not as forgiving as regular breads. If you let it rise longer than the stated amounts, it will actually start to deflate. Also, you need parchment paper to put your loaf on when rising the second time and when cooking. You can carefully move the parchment paper with the gluten-free loaf of bread into the La Cloche without much movement or destruction to the size. Serve this delicious gluten-free artisan bread with a big raw kale salad. (recipes below). See this link for my Whole Wheat Raisin-Walnut Artisan Bread and check out Breatopia for some good videos on making all different types of Artisan Bread. 1.) Mix the flours, yeast, salt and xanthan gum in a bowl. Combine the oil, agave and water, set aside. Mix the flax seed and water together with spoon until egg like. Dump the flax seed mixture into the dry ingredients and then stir while you pour in about 1/3 of the oil and water mixture. Continue to stir while you pour in another 1/3 of the liquid. The dough will start to come together in a thick dough. Add the final 1/3 of the liquid and stir until the dough is nice and smooth. 3.) 30 minutes before baking time preheat oven with either a 5 1/2 quart Dutch Oven or a La Cloche to 500 degrees. The dough will not have grown much while resting, but it will seem a little bit puffier. Use a serrated knife to gently cut slashes on top of the bread. 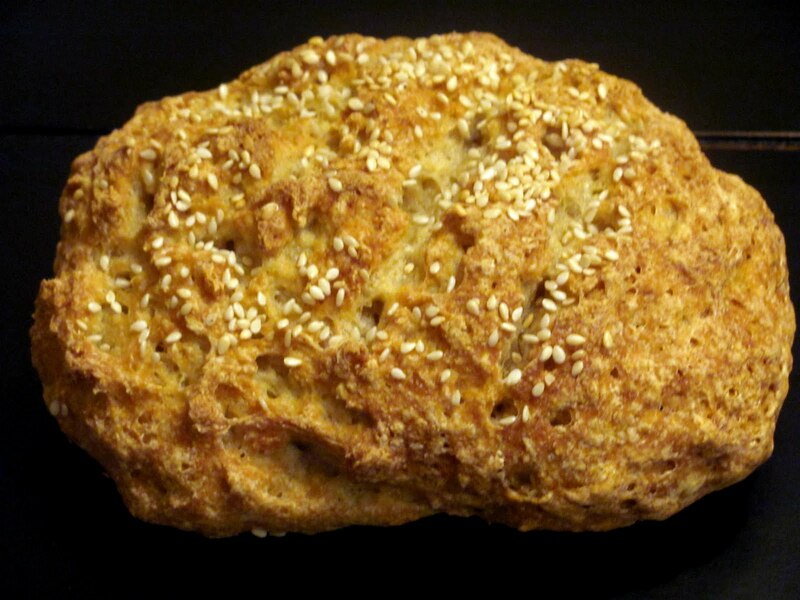 Sprinkle with sesame seeds and place parchement paper with bread in Dutch Oven or La Cloche with lid on. Bake for 20 minutes and then remove lid. Reduce oven temperature to 350 and cook another 15 minutes. 1.) 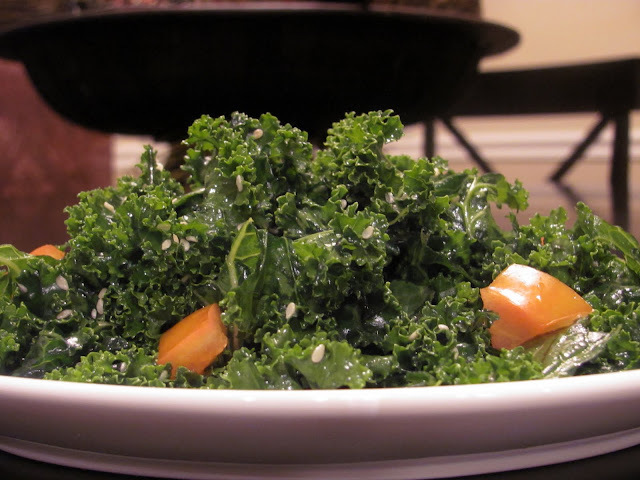 To prepare kale remove the tough center stalk by pulling the leaves off of it. Then wash the kale and break into smaller pieces. 2) Add all ingredients in bowl except sesame seeds and tomato. Message kale leaves until soft and reduced in size. Add sesame seeds and diced tomato and mix well. Serve or store in refrigerator until ready to eat. I'll have to revisit this post in a few years. I want to bake my own bread again, but this is way too advanced for me. This is just one more reason why I need a dutch oven. I KNOW how hard you worked to get a great tasting gluten free artisan bread! Great job! Stephanie, I have made my artisan breads in both the La Cloche and a dutch oven and they both work great. You will love this bread. That bread looks absolutely wonderful! I've been avoiding yeast for a while, but I really want to try it just so I can make this! I noticed on the Artisan Bread in Five website they bake the bread for 20 at 500 degrees and then 15 min at 450 degrees. You said you do 20 at 500 and then 15 at 350. Which is the best temperature to lower it to? Is your's different because you are using a La Cloche?